NMC and MSU offer a joint program where students dual enroll at NMC and MSU. 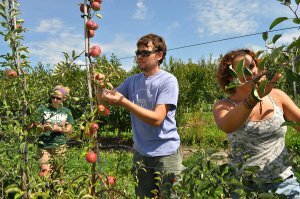 Students earn an Applied Science degree in Fruit and Vegetable Crop Management through NMC, and a certificate in Agricultural Technology from Michigan State University. All courses are taught in Traverse City. Upon meeting the program requirements for the AAS, students may transfer to the MSU East Lansing Campus as a junior to complete a Bachelor of Science degree. See your MSU advisor prior to enrolling each semester. MSU Transfer Students: Students wishing to transfer to MSU as juniors must meet with the program coordinator during their first semester to alter general education courses to meet MSU transfer requirements.